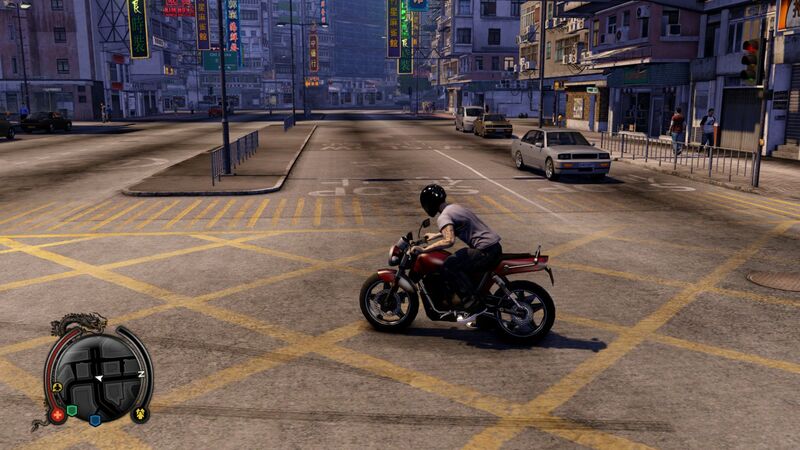 Asian GTA. 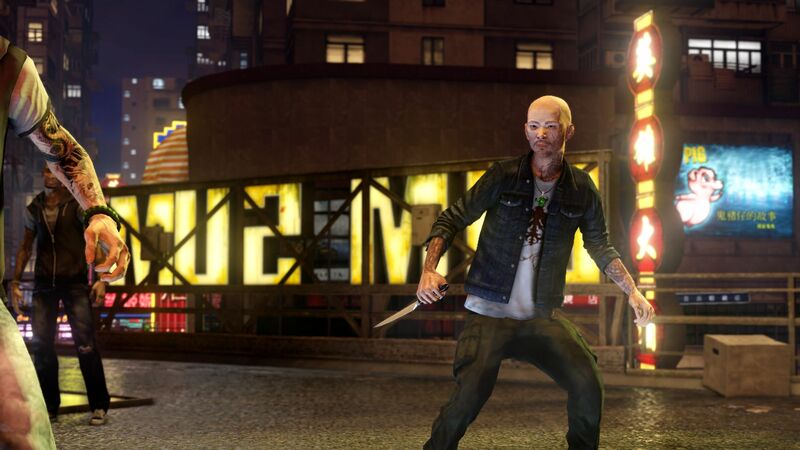 With Sleeping Dogs, the publisher Square Enix releases a serious rival of Grand Theft Auto. 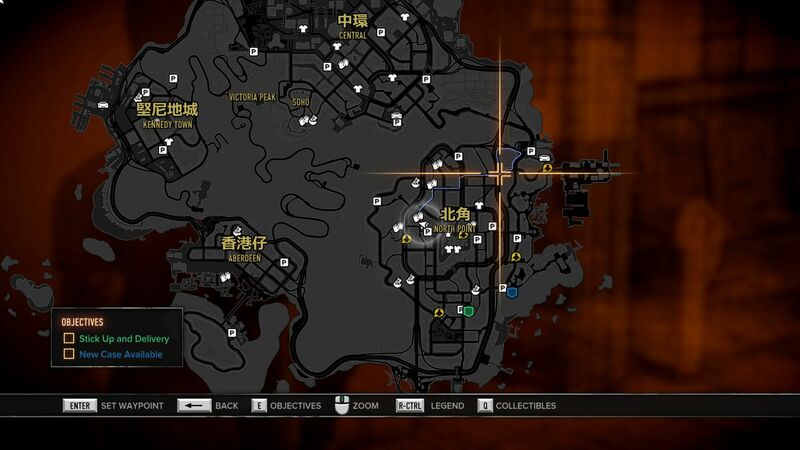 The open world game is set in Chinese Hong Kong and features a never-before used scenario as well as an exciting story about the Triad. 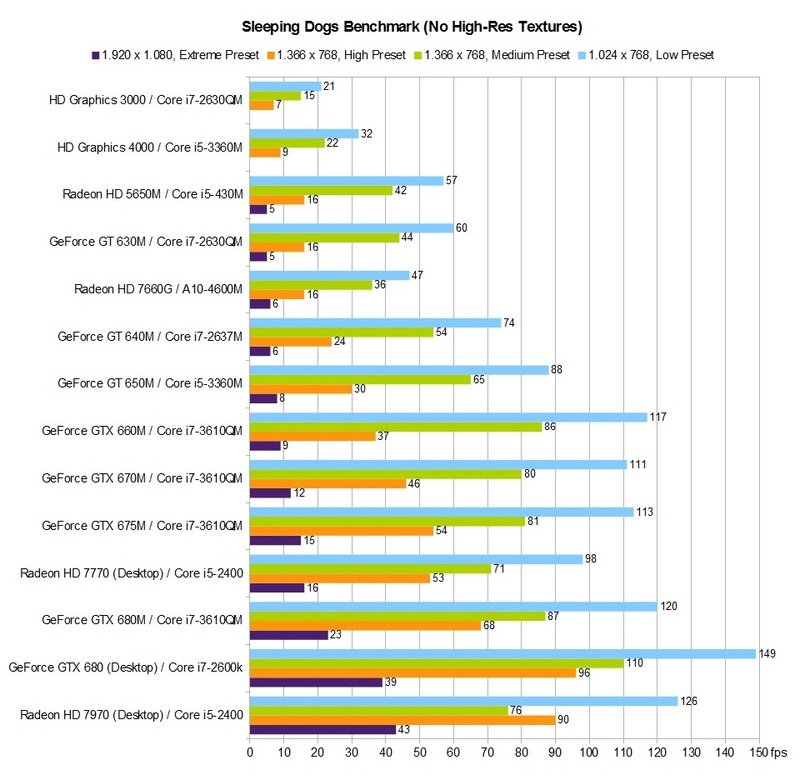 In this review, you will read how current notebook GPUs perform in the game. 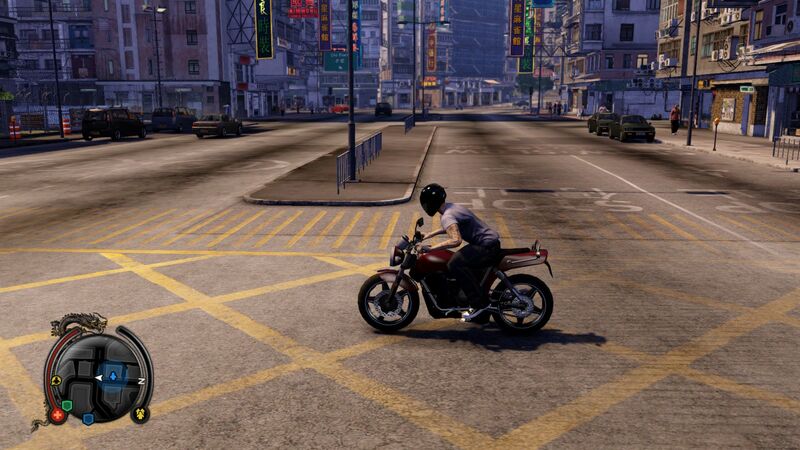 The heading ”Asian GTA” is not at all meant as derogatory – on the contrary. 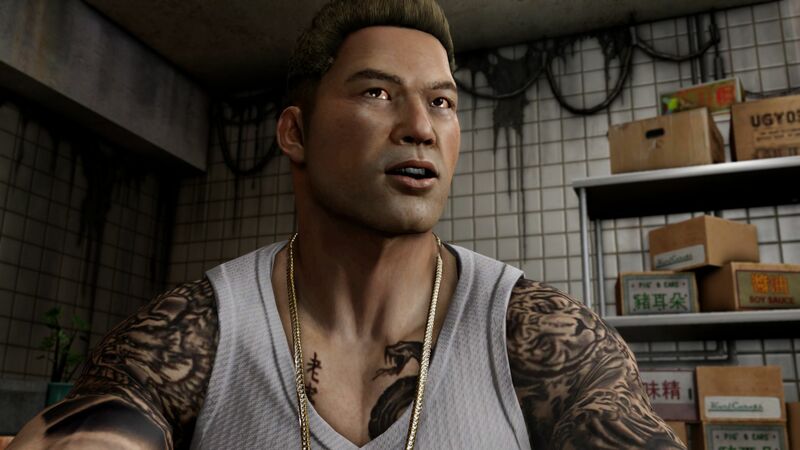 After having played a couple of hours, we can say that Sleeping Dogs must not hide behind the amazing role model. The multi-platform title is based on the familiar and beloved mix of combat scenes, action-oriented missions, and vehicle use. 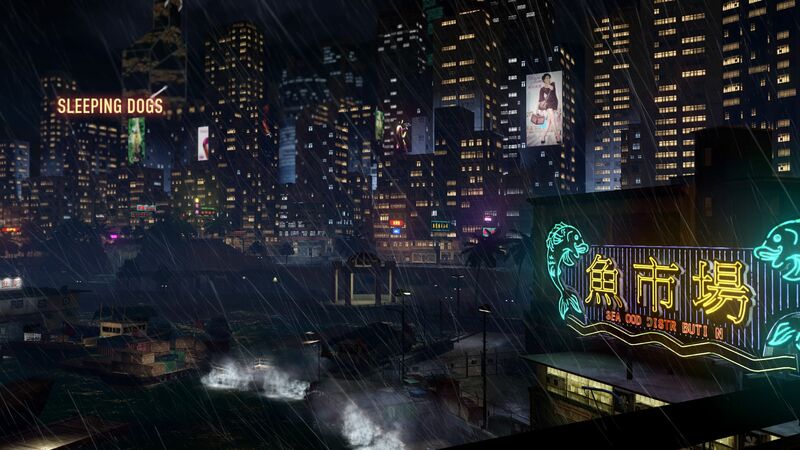 As we mentioned, Sleeping Dogs is set in the metropolis of Hong Kong. This rarely used place in PC games makes for the ideal setting of an adult gangster story. The detailed screenshots prove that the developer has put proper effort in the implementation of the game. 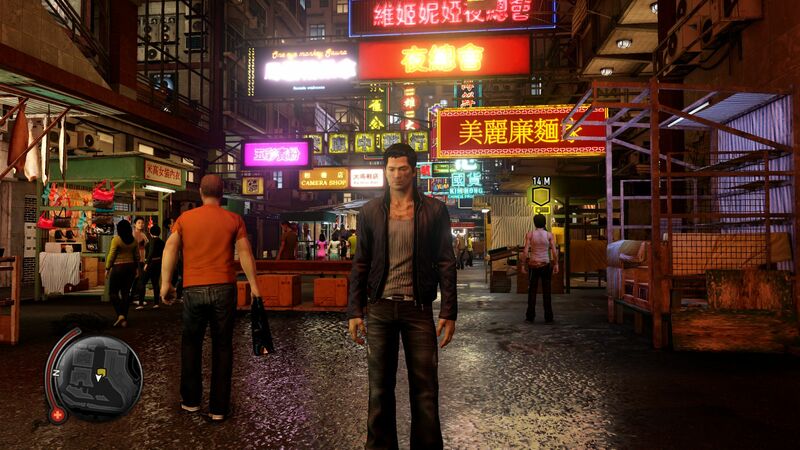 Shortly after the start, the main character strolls through a densely populated shopping street, on which a sort of street festival is taking place. Here lavishly decorated stands alternate with bright neon signs. The colorful reflections on the wet pavement give the scene a great lighting effect. 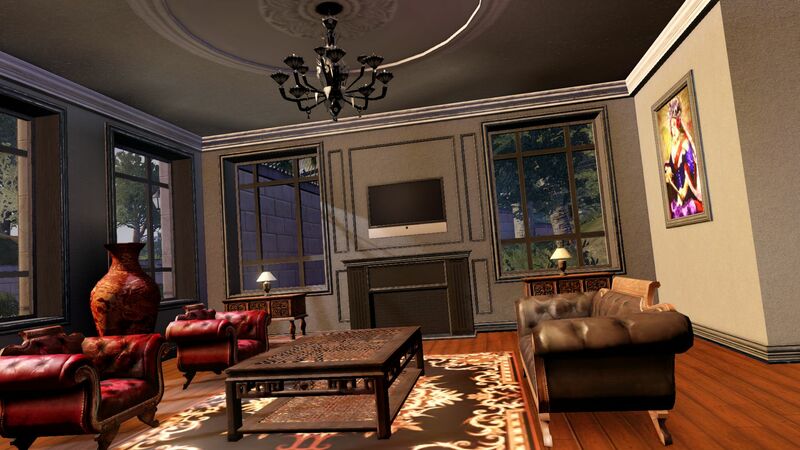 It's a shame that the richness decreases noticeably in some backyards and side rooms. The linear Max Payne 3 achieves a higher quality here. Nonetheless, the action title scores points with a successful atmosphere. The cool soundtrack and professional (English) voice-over do the rest to put the player under the spell. 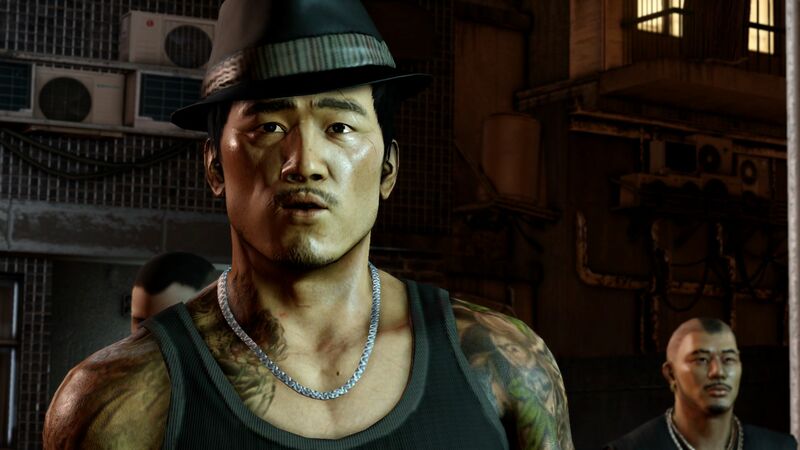 But who is actually personified in Sleeping Dogs? 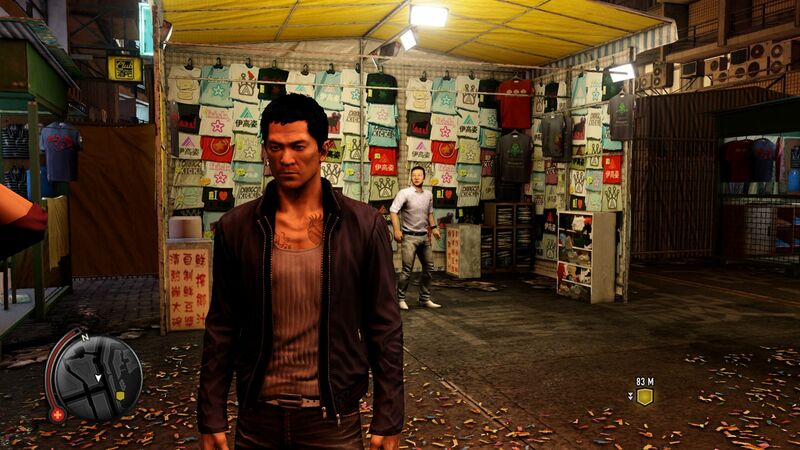 The gamer steps in the shoes of Wei Shen, a – as we soon discover – cunning undercover cop. The goal: The infiltration of the Triad “Sun On Yee”. In the early stages, the leader Winston Chu has problems with “Dogeye”, who wants to claim a part of the territory for himself. The main character is actually a policeman. He must infiltrate the Triads. The gangster bosses do not talk good about each other. After several intro videos, a heated pursuit and a couple of dialogs, things get quickly to the point – in the true sense of the word. 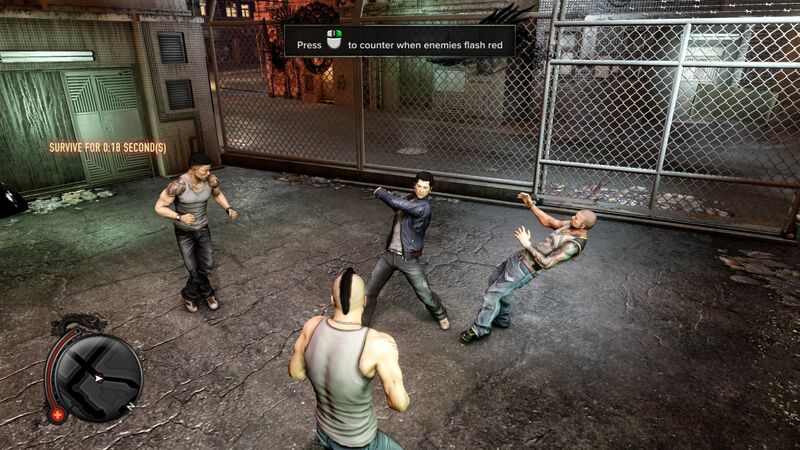 Wei Shen fights the other gang members and so, soon learns the fight moves/controls. The tough confrontations do have a certain esthetic. The movement is usually quite smooth and generally the fights have a beautiful choreography. Of course one could argue about the brutal finishing moves (in Germany the title will arrive censored), which are sometimes certainly borderline. Since the fights feel somewhat slower than in other action hits such as Darksiders II or Batman: Arkham City, we can imagine that the melee battles will get tiresome after some time and develop a repetitive nature. Some places are extremely detailed. Things get heated during fights. The game world is quite impressive. The role-playing part seems to further motivate in the long term. 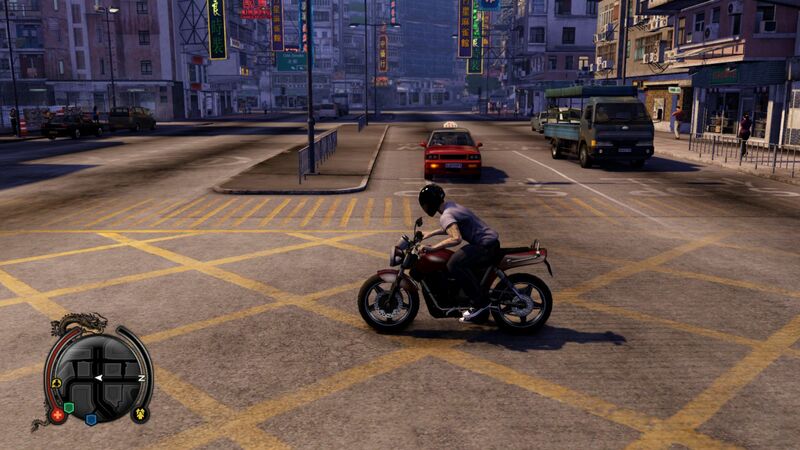 Sleeping Dogs contains various primary and side missions, which emphasize one or the other gameplay elements. At the end there is a brief rating, which informs the player of their skills and progress. In addition to the traditional rewards (money, items, etc.) 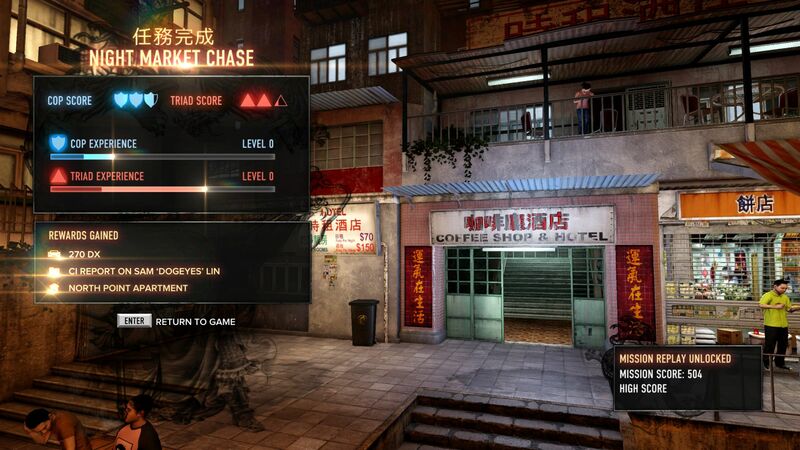 the player receives experience points in specific categories (for example Triad or Cop). At a level-up, new skills and upgrades await the player. 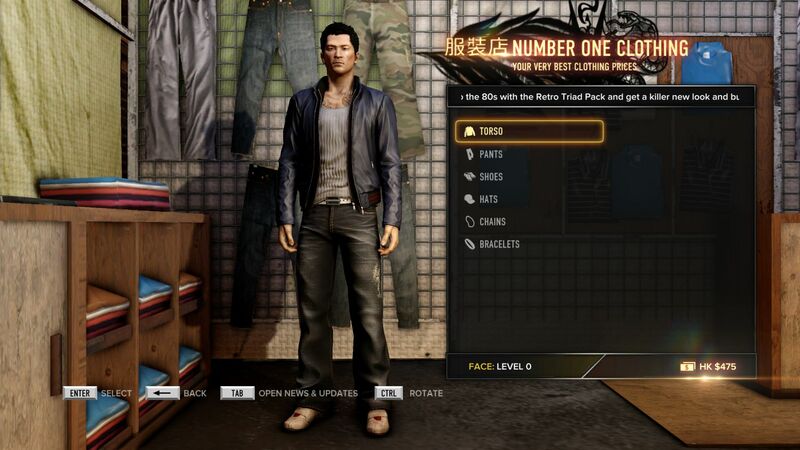 Fashionable gamers can even clothe the main character. The range extends from shoes through necklaces to headgear. You can level-up through the experience points. 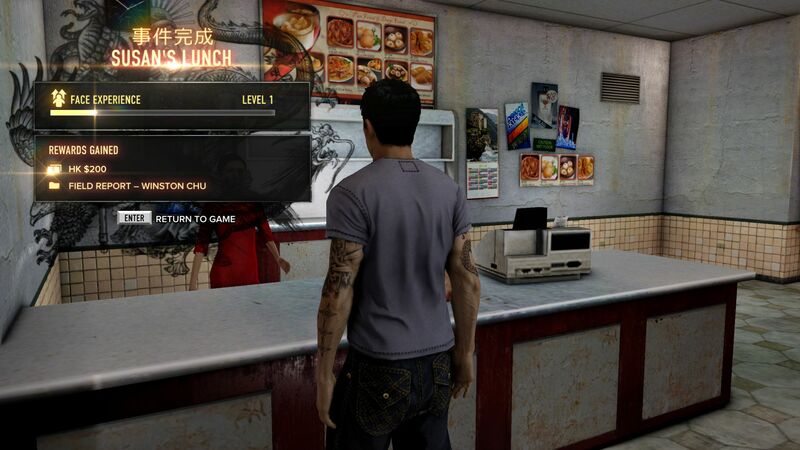 Sleeping Dogs offers numerous side missions. The character dresses up before the fights. In order to not run unnecessarily through the areas, the main character has a mobile phone, which lists contacts, messages, and police reports, among other things. Consequently, the most important is the garage, which is used to store an owned vehicle. While we are on the subject of vehicles: The wheels are controlled with the mouse and keyboard, but often inaccurately. Another weakness is the sub-optimal and sometimes wobbly camera. There's nothing better than a modern smartphone. The police reports provide background information. Great: The vehicles can be repainted. Square Enix deserves praise for the integrated benchmark. The roughly two-minute sequence provides a nice glimpse into the game world, the cultural environment, and the capabilities of the engine. Thanks to the changing scenes, the graphics card is loaded at varying rates. Since the frame rate drops during graphically intense passages (motorcycling, car driving, etc. 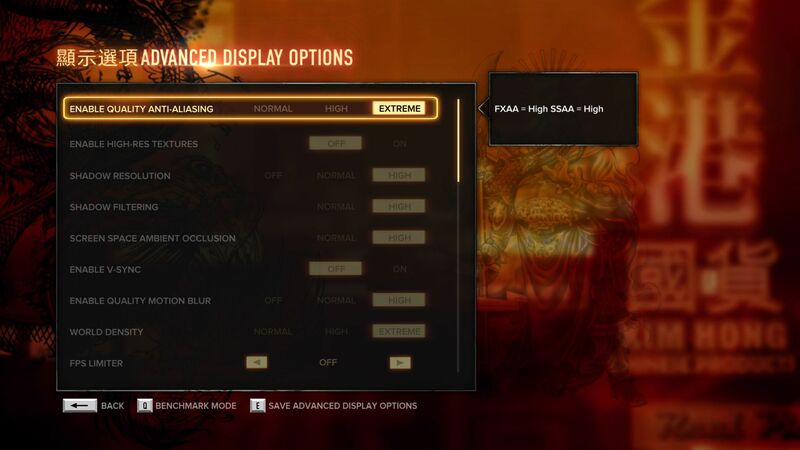 ), 30 or even 40 fps are desired as a result of the benchmark. 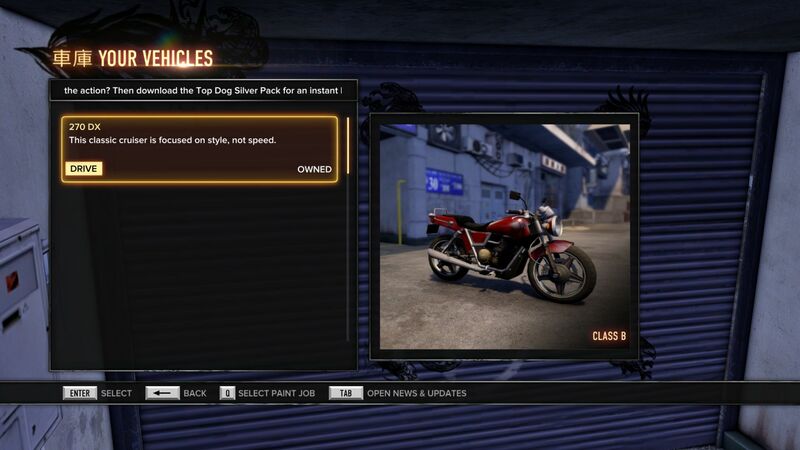 For a multi-platform title, Sleeping Dogs offers a surprisingly high number of settings. We ran our benchmark with the four presets; Low, Medium, High, and Extreme, which are located in the main menu, under the Display Options. 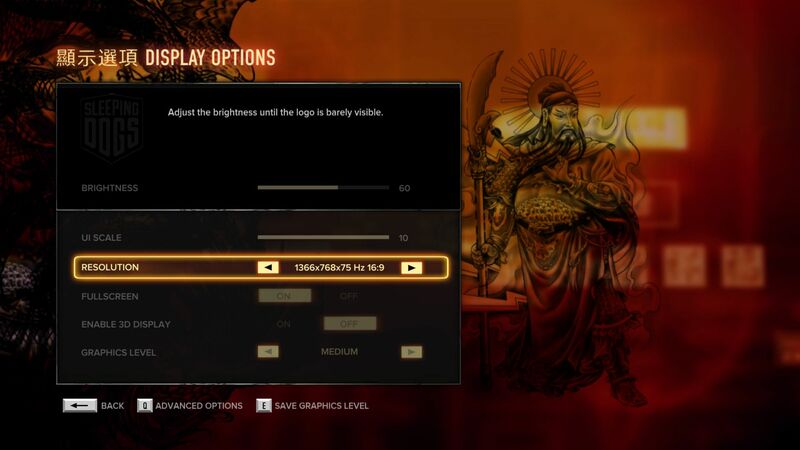 In addition to the brightness, you can also adjust the size of the interface and the resolution. 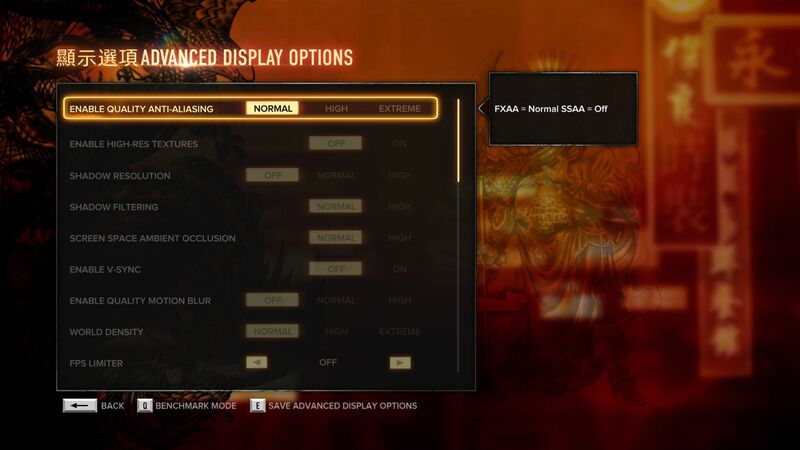 Full-screen mode and the 3D mode can also be (de)activated. 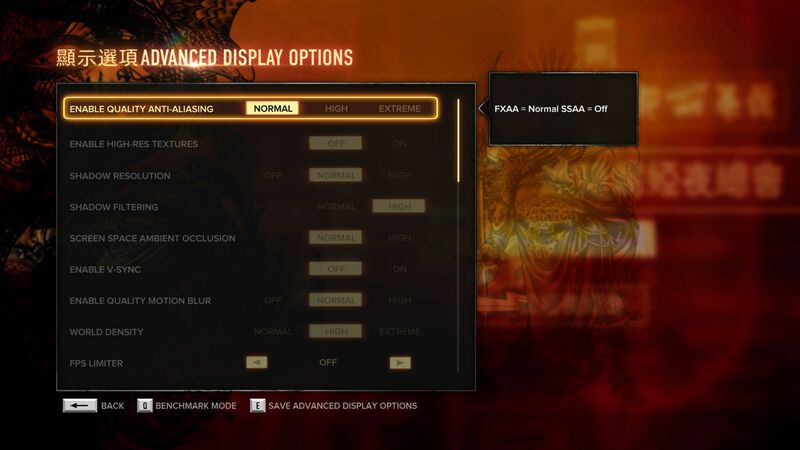 Even more options can be found in the advanced graphics menu. 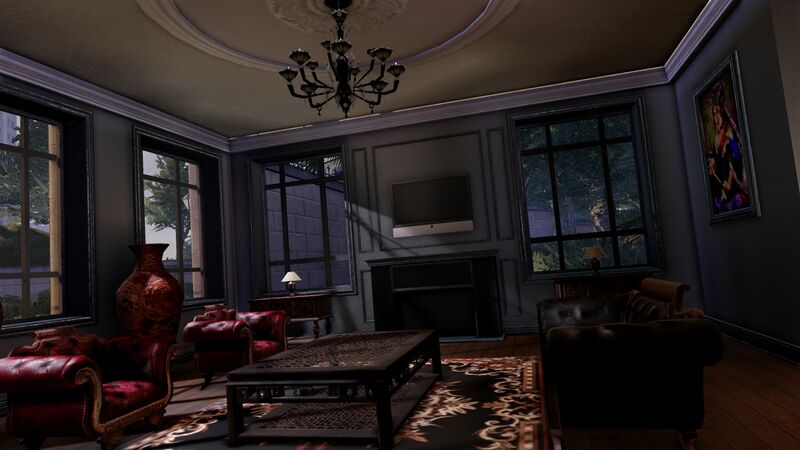 Thus the player can, among others, change the V-Sync, the hardware-hungry anti-aliasing, the motion blur, the shadow quality, and the world density. The high-resolution textures were unfortunately not available for download at the time of this review – at least not in Germany (Steam error message). 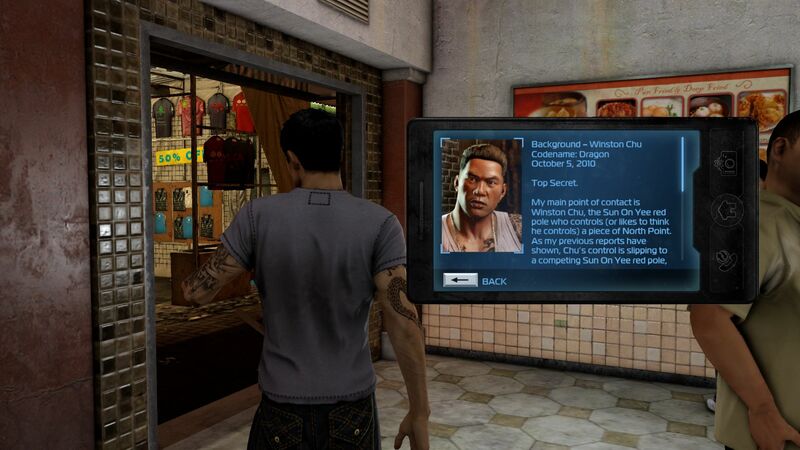 Technically, Sleeping Dogs is still a bit unpolished. A change in the settings often leads to errors and crashes. The title works rather poorly with NVIDIA GPUs. Despite the latest Beta drivers (ForceWare 304.79) the game sometime hung when starting up or loading. Otherwise the engine is relatively good - we were particularly impressed by the fancy character models and the high-quality lighting. Even at medium details, the game is properly enjoyable. Although you can barely notice the difference between high and ultra settings, the resource consumption increases significantly. As our benchmarks show, for the Extreme settings you would need an absolutely top of the line desktop GPU (or SLI respectively CrossFire). At low settings, the game is suited even for low-end graphics cards, but the reduced effects diminish the atmosphere considerably. 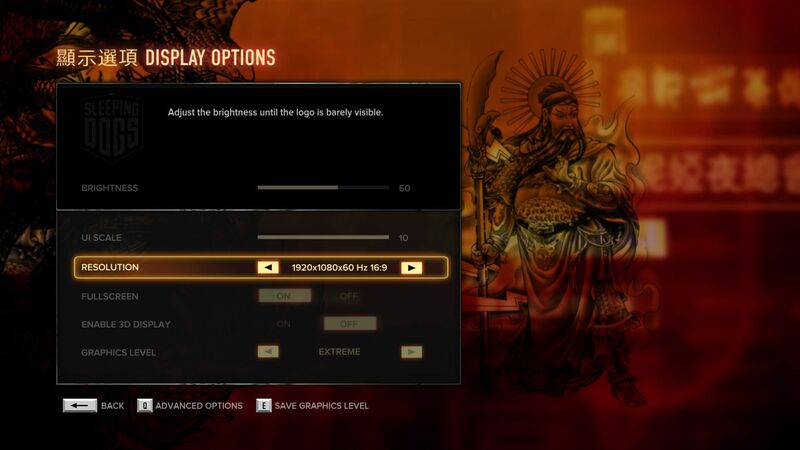 While the combination of maximum details and 1920x1080 pixels is reserved only for luxury GPUs such as the GeForce GTX 680 or the Radeon HD 7970 (Desktop! 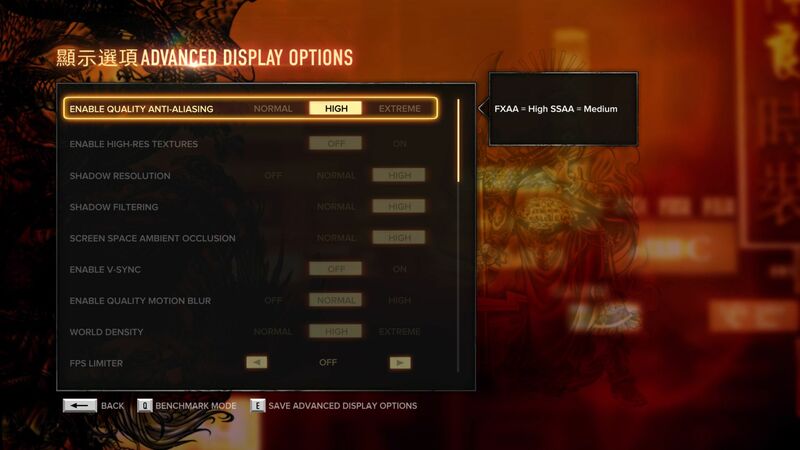 ), 1600x900 pixels and high details are also playable with a mobile high-end card (for example GTX 675M). For 1366x768 pixels the GeForce GTX 660M or higher should suffice. 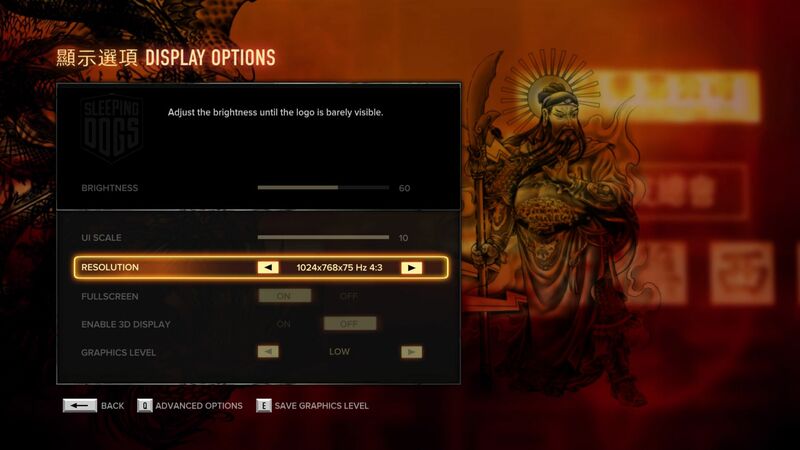 The middle preset requires an all-rounder such as the GeForce GT 630M or the Radeon HD 7660G. 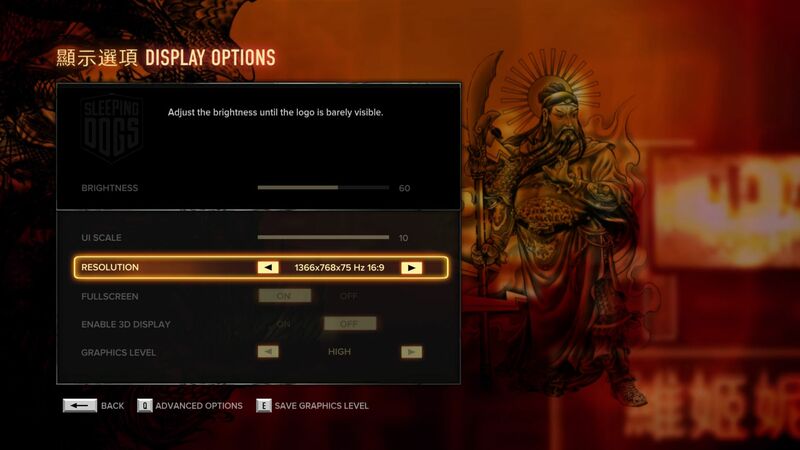 Entry-level GPUs on the level of the Intel HD Graphics 4000 will have to be satisfied with lower details and greatly reduced resolution (1024x768) – and the game still stutters sometimes. 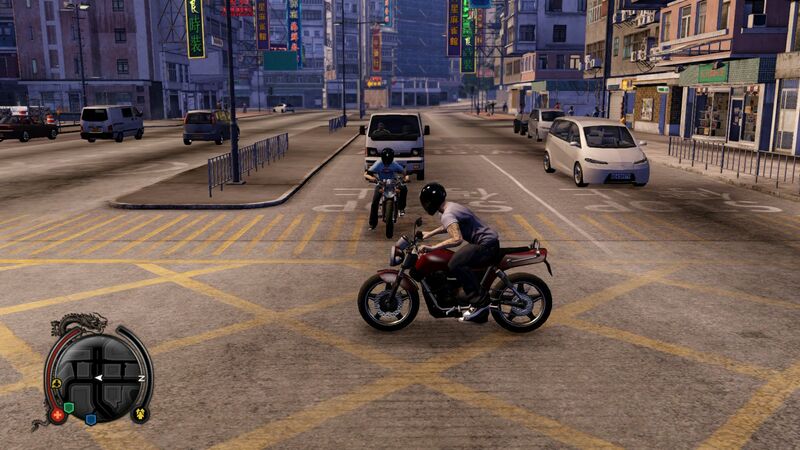 If you like open-world titles in the style of GTA, you should definitely give the Hong Kong adventure a chance. 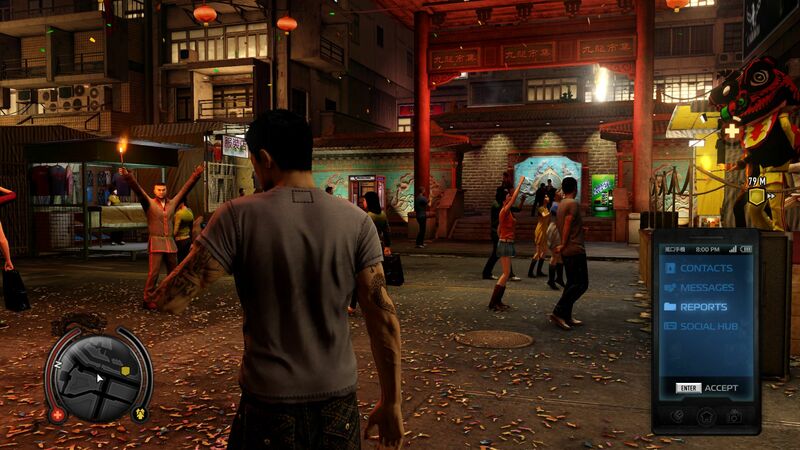 Sleeping Dogs is gorgeous and provides a solid mix of elements from various genres. Thanks to familiar key strokes you can quickly immerse yourself in the unfamiliar scenario. Although, you should not expect a new action reference, since the game does not come even close to perfection. We consider the introduction a success. The large world should ensure a high playtime. Sleeping Dogs definitely does not belong in children's hands. NVIDIA driver: mostly 304.79 Beta. AMD driver: 12.4 (Desktop) and 12.8 (Notebook). Intel driver: 8.15.10.2696. The following list will be constantly updated.